Every social gathering is incomplete without a drink or two. It is the fail-proof way to break the ice. For a wife, whose husband likes to entertain and have guests home pretty frequently, it is a must to have the bar stocked all the time. 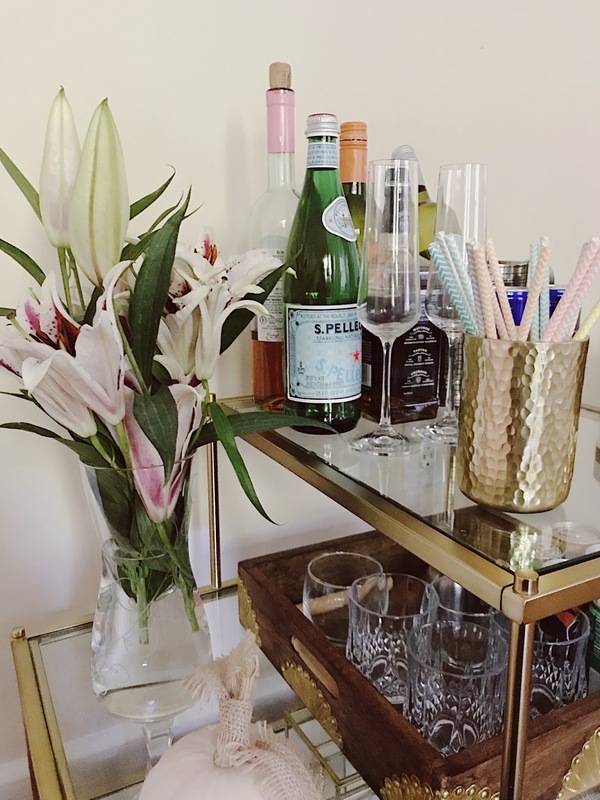 Having said that, I had only shared cocktail recipes on the blog before, but today I am bringing to your feed the essentials of a happening Bar Cart / Home Bar. 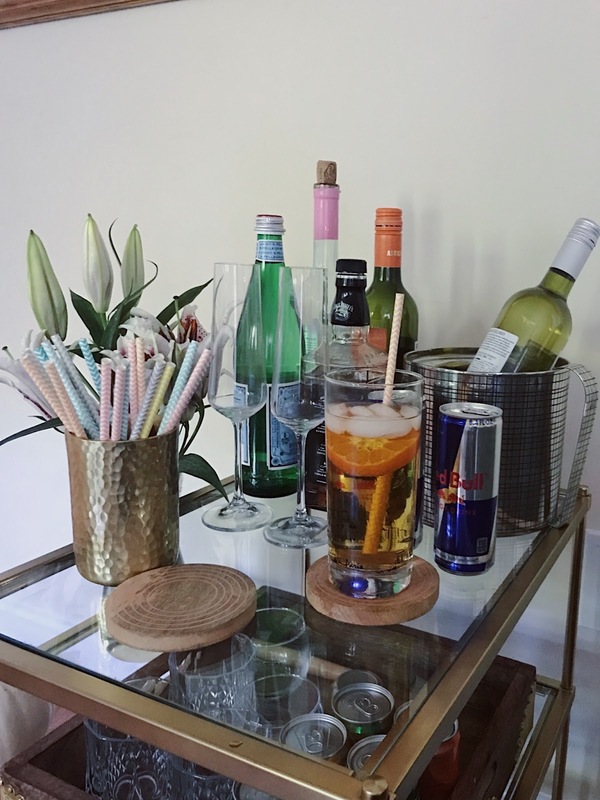 1) FIND THE RIGHT BAR CART- the key to finding a good bar cart is the knowledge of the space and decor aesthetics. 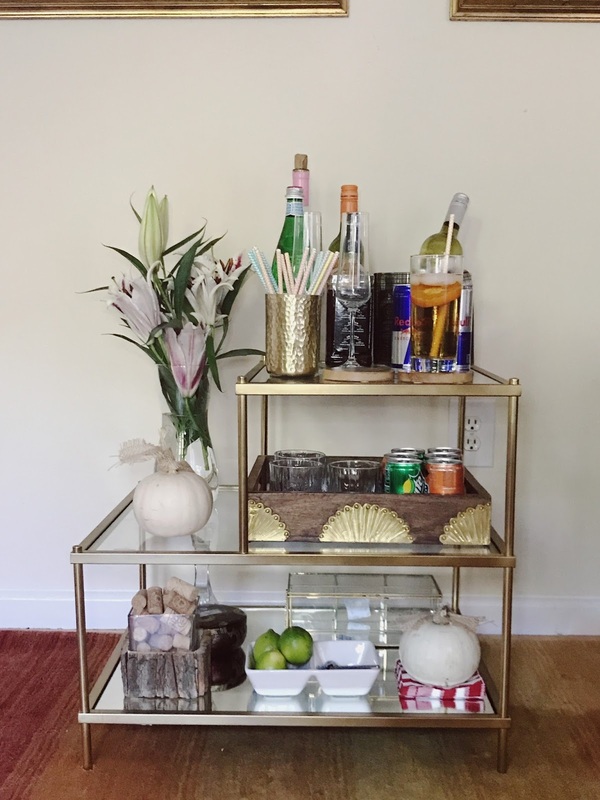 A metal bar cart like this would be ideal for a more contemporary set up, but if your aesthetics is more traditional a glass curio or a a glass hutch would be befitting. 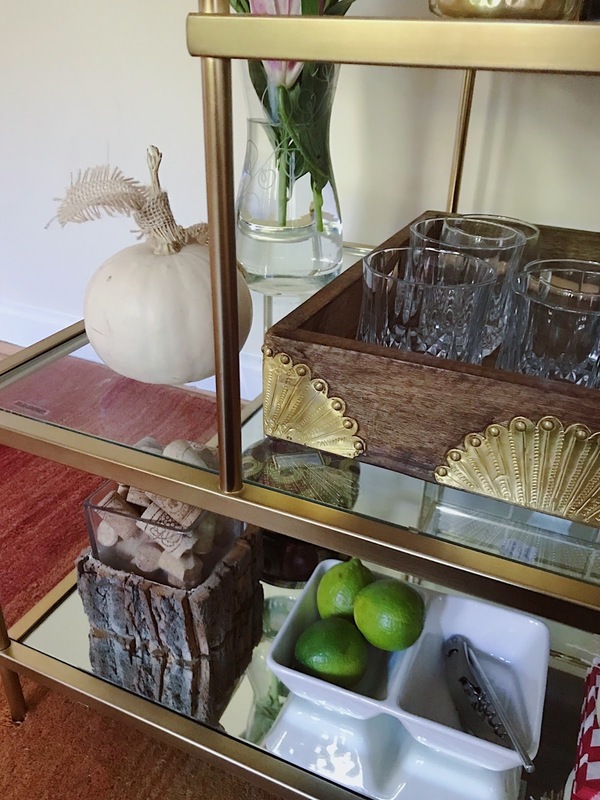 The color scheme for my living room is more gold, blue, and touch of wood, hence this gold side table turned bar cart worked for my space. Remember to bring the measurements of the space, where you would like to place the bar cart, to your next furniture shopping trip. 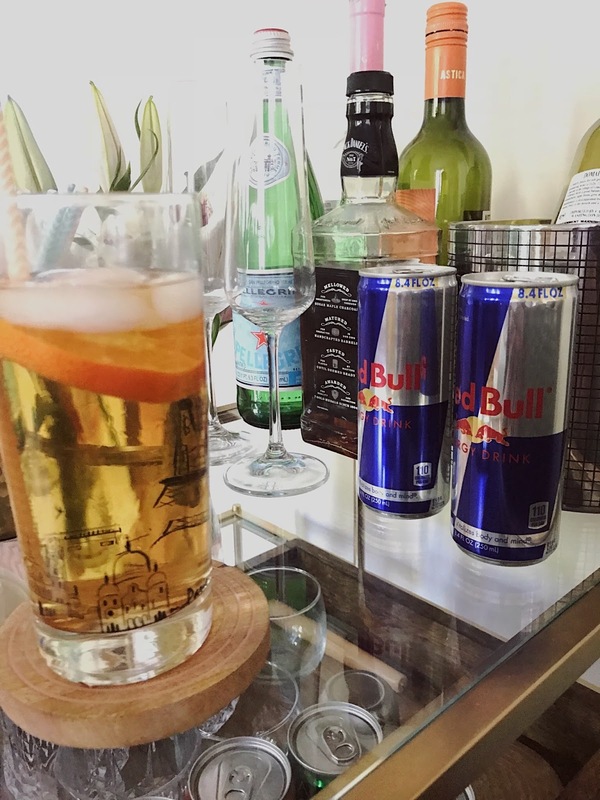 2) STOCK UP ON THE ALCOHOL - think of the multiple group of drinks you like and would like to serve, and buy the ingredients accordingly. For instance there are martinis, margaritas, beers, hard liquor and scotch to name a few. Make a list of all you would like and stock up whenever there is a sale or great offer. The key bases that I like to have handy are tequila, rum, vodka, beer, scotch, wine and baileys. You could mix and match the aforementioned with other mixers to make your favorite cocktails. Add water, sparkling water ( both original and flavored ), fruit juices and aerated drinks to the above list. 3) BARWARE/ STEMWARE - you can never have enough of Barwares and stemwares. There are so many options out there, that it can get mind-boggling. Sticking to the classic crystal will simplify your life. Macy's is my favorite store for all the barware needs. They house most of my favorite brands like Waterford, Lenox, Mikasa, and Martha Stewart to name a few. Scotch glasses, martini glasses, wine goblets, flutes, mule mugs ( that can double up as beer mugs ) are a few barware essentials. Add a decanter, ice-bucket and chiller if the space permits. 4) DON'T FORGET THE BAR EXTRAS - when I say extras I mean the tools and garnishing stuff. Tools like bottle openers, corkscrew and cap lifters, tongs, measuring cups, cocktail shaker, stirrer, knives, napkins, kitchen towel, scissors and so on so forth. A boxed bar set that has most of the tools is the easiest way out. Also it makes for a good gift. Apart from this the most commonly used garnishing items are lemons, oranges, cherries, fancy straws and cocktail umbrellas. I can never have enough of these garnishes. 5) ADD FLOWERS AND SEASONAL TOUCHES- flowers are a good way to bring it all together. They make for the most affordable and prettiest way to putting the final touches to any set up. So when in doubt, use flowers. 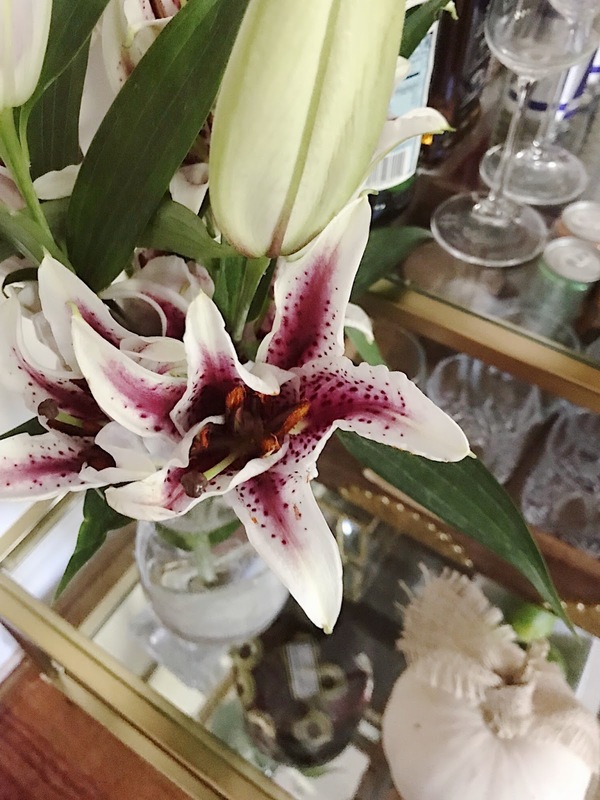 Other than this, adding an element of the season gives a fresh update to your bar cart every few months. As we are in October, the harvest month, I wanted to add the burlap top pumpkins and the rustic woody candleholder. Come December and I might swap the pumpkin with some holiday charms and ornaments.